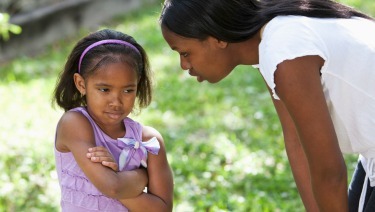 Healthy Children > Family Life > Family Dynamics > Communication & Discipline > What’s the Best Way to Discipline My Child? As a parent, one of your jobs to teach your child to behave. It's a job that takes time and patience. But, it helps to learn the effective and healthy discipline strategies. Give consequences. Calmly and firmly explain the consequences if they don't behave. For example, tell her that if she does not pick up her toys, you will put them away for the rest of the day. Be prepared to follow through right away. Don't give in by giving them back after a few minutes. But remember, never take away something your child truly needs, such as a meal. Give them your attention. The most powerful tool for effective discipline is attention—to reinforce good behaviors and discourage others. Remember, all children want their parent's attention. Catch them being good. Children need to know when they do something bad--and when they do something good. Notice good behavior and point it out, praising success and good tries. Be specific (for example, "Wow, you did a good job putting that toy away!"). Know when not to respond. As long as your child isn't doing something dangerous and gets plenty of attention for good behavior, ignoring bad behavior can be an effective way of stopping it. Ignoring bad behavior can also teach children natural consequences of their actions. For example, if your child keeps dropping her cookies on purpose, she will soon have no more cookies left to eat. If she throws and breaks her toy, she will not be able to play with it. It will not be long before she learns not to drop her cookies and to play carefully with her toys. Redirect bad behavior. Sometimes children misbehave because they are bored or don't know any better. Find something else for your child to do. Call a time-out. A time-out can be especially useful when a specific rule is broken. This discipline tool works best by warning children they will get a time out if they don't stop, reminding them what they did wrong in as few words―and with as little emotion―as possible, and removing them from the situation for a pre-set length of time (1 minute per year of age is a good rule of thumb). With children who are at least 3 years old, you can try letting their children lead their own time-out instead of setting a timer. You can just say, "Go to time out and come back when you feel ready and in control." This strategy, which can help the child learn and practice self-management skills, also works well for older children and teens. The AAP policy statement, "Effective Discipline to Raise Healthy Children," highlights why it's important to focus on teaching good behavior rather than punishing bad behavior. Research shows that spanking, slapping and other forms of physical punishment don't work well to correct a child's behavior. The same holds true for yelling at or shaming a child. Beyond being ineffective, harsh physical and verbal punishments can also damage a child's long-term physical and mental health. Spanking's unhealthy cycle. The AAP advises that parents and caregivers should not spank or hit children. Instead of teaching responsibility and self-control, spanking often increases aggression and anger in children. A study of children born in 20 large U.S. cities found that families who used physical punishment got caught in a negative cycle: the more children were spanked, the more they later misbehaved, which prompted more spankings in response. Spanking's effects may also be felt beyond the parent-child relationship. Because it teaches that causing someone pain is OK if you're frustrated—even with those you love. Children who are spanked may be more likely to hit others when they don't get what they want. Lasting marks. Physical punishment increases the risk of injury, especially in children under 18 months of age, and may leave other measurable marks on the brain and body. Children who are spanked show higher levels of hormones tied to toxic stress. Physical punishment may also affect brain development. One study found that young adults who were spanked repeatedly had less gray matter, the part of the brain involved with self-control, and performed lower on IQ tests as young adults than the control group. Verbal abuse: How words hurt. Yelling at children and using words to cause emotional pain or shame also has been found to be ineffective and harmful. Harsh verbal discipline, even by parents who are otherwise warm and loving, can lead to more misbehavior and mental health problems in children. Research shows that harsh verbal discipline, which becomes more common as children get older, may lead to more behavior problems and symptoms of depression in teens. Remember that, as a parent, you can give yourself a time out if you feel out of control. Just make sure your child is in a safe place, and then give yourself a few minutes to take a few deep breaths, relax or call a friend. When you are feeling better, go back to your child, hug each other, and start over. If you do not handle a situation well the first time, try not to worry about it. Think about what you could have done differently and try to do it the next time. If you feel you have made a real mistake in the heat of the moment, wait to cool down, apologize to your child, and explain how you will handle the situation in the future. Be sure to keep your promise. This gives your child a good model of how to recover from mistakes. ​Babies learn by watching what you do, so set examples of behavior you expect. Use positive language to guide your baby. For example, say, "Time to sit," rather than, "Don't stand." Save the word, "no," for the most important issues, like safety. Limit the need to say "no" by putting dangerous or tempting objects out of reach. Distracting and replacing a dangerous or forbidden object with one that is okay to play with is a good strategy at this age. All children, including babies, need consistent discipline, so talk with your partner, family members, and child care provider to set basic rules everyone follows. ​Your child is starting to recognize what's allowed and what isn't but may test some rules to see how you react. Pay attention to and praise behaviors you like and ignore those you want to discourage. Redirect to a different activity when needed. Tantrums can become more common as your child struggles to master new skills and situations. Anticipate tantrum triggers, like being tired or hungry, and help head them off with well-timed naps and meals. Teach your toddler not to hit, bite, or use other aggressive behaviors. Model nonviolent behavior by not spanking your toddler and by handling conflict with your partner in a constructive way. Stay consistent in enforcing limits. Try short time-outs if needed. Acknowledge conflicts between siblings but avoid taking sides. For example, if an argument arises about a toy, the toy can be put away. ​Preschool-age children are still trying to understand how and why things work and what effect their actions have. As they learn appropriate behavior, expect them to continue testing the limits of parents and siblings. Begin assigning age-appropriate chores, like putting their toys away. Give simple, step-by-step directions. Reward them with praise. Allow your child to make choices among acceptable alternatives, redirecting and setting sensible limits. Teach your child to treat others as she wants to be treated. Explain that it's OK to feel mad sometimes, but not to hurt someone or break things. Teach them how to deal with angry feelings in positive ways, like talking about it. To resolve conflicts, use time-outs or remove the source of conflict. ​Your child is beginning to get a sense of right and wrong. Talk about the choices they have in difficult situations, what are the good and bad options, and what might come next depending on how they decide to act. Talk about family expectations and reasonable consequences for not following family rules. Provide a balance of privileges and responsibility, giving children more privileges when they follow rules of good behavior. Continue to teach and model patience, concern and respect for others. Don't let yourself or others use physical punishment. If you live in an area where corporal punishment is allowed in schools, you have the right to say that your child may not be spanked. ​As your teen develops more independent decision-making skills, you'll need to balance your unconditional love and support with clear expectations, rules, and boundaries. Continue to show plenty of affection and attention. Make time every day to talk. Young people are more likely to make healthy choices if they stay connected with family members. Get to know your teen's friends and talk about responsible and respectful relationships. Acknowledge your teen's efforts, achievements, and success in what they do―and don't do. Praise the choice to avoid using tobacco, e-cigarettes, alcohol, or other drugs. Set a good example through your own responsible use of alcohol and other substances.